John McGregor gives a tour of the barrel room, where the Black Russian Red ages for nearly three years prior to release. One of the pervasive knocks against a cool-climate wine region is that it has difficultly producing full-bodied red wines, like those from California, which command big prices. Although Finger Lakes white wines have been celebrated for decades, mostly for Riesling, the jury is still out on what the “go-to” red variety will be. Some wineries have emphasized Pinot Noir, grown well in the relatively cool Burgundy region of France, or the so-called Bordeaux varieties of Merlot, Cabernet Sauvignon and Cabernet Franc. What about Saperavi and Sereksiya Charni? Yes, these grapes are a mouthful to pronounce, but they illustrate the salient point that most wine drinkers are familiar only with the types of grapes that originate from Western Europe. There are thousands of varieties of vinifera grapes, grown in various climates across Eastern Europe, the Mediterranean and Asia Minor. In many cases, these grapes have cultivated for a millennia. It was with climate curiosity in mind that Bob and Marge McGregor, founders of McGregor Vineyard and Winery on Keuka Lake, sought out some experimental varieties in the late 1970s that might prove both winter-hardy and well-suited to the Finger Lakes growing season. Saperavi is a long-cultivated grape from the former Soviet Republic of Georgia, which Dr. Konstantin Frank experimented with on the shores of Keuka Lake in the 1950s. Bob McGregor planted this variety in 1980, producing on a commercial scale the first bottles of Saperavi in the Finger Lakes and possibly the United States. Serksiya Charni, an extremely rare grape grown in obscure sites around the Black and Caspian Seas in Ukraine, Armenia and Romania, was acquired by McGregor in 1985. They believe that McGregor is still the only winery in the Western Hemisphere to cultivate and produce wine made from this red variety. It was bottled separately throughout the 1980s, but eventually Bob McGregor decided to blend Saperavi and Sereksiya Charni together in 1991 and call the combination Black Russian Red. 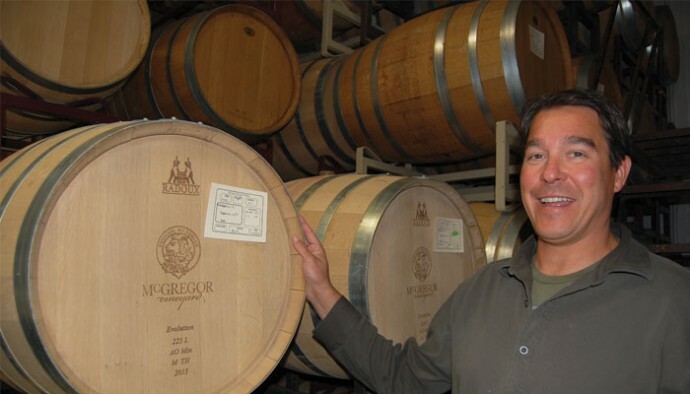 “My father recognized, in the European tradition, that blending creates a greater degree of complexity,” explains John McGregor, who took over the winery after his father’s retirement. Prior to starting its Black Russian program, McGregor’s founded a wine club called the Clan Club. Over the years it grew to embrace this unique red as a focal point of consumer appreciation for the McGregor dedication to quality vinifera wine. While Black Russian Red is available to all consumers, wine club members are particular adherents to this wine. John believes that at least 20 percent of the McGregor Clan Club members have been members for 15 years or more. “It’s like a giant family reunion every year,” John says. “At our annual Clan Club picnic people come from all over; one year we had people travel from as far away as Hawaii.” Members are also privy to new releases, white and red barrel tasting events, discounts and special events. Wine drinkers who are new to Black Russian Red can expect a wine that is reminiscent of a full-bodied Syrah (Shiraz in Australia). Starting in 2007, the winery began to age the wine a minimum of 24 months (often 30 months) in American oak barrels to soften its tannins and allow the wine to mature. Therefore, the winery releases the “newest” vintage of Black Russian Red nearly 3-1/2 years after harvest. At the latest Black Russian release party in March of 2015, for instance, the 2011 vintage was served. Black Russian Red is a big wine that is produced for long-aging in the bottle – something a consumer should keep in mind when recognizing that the wine is priced at a higher point than most Finger Lakes reds. John McGregor recalls that, at the 2014 Clan Club picnic, he auctioned off a bottle of the original 1991 vintage, hardly expecting the wine to be in top shape. Much to John’s surprise, wine club members embraced the auction with fervor. The eventual winner invited John over to open the bottle. 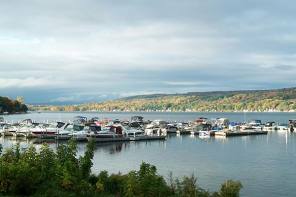 The McGregor tasting room, on the eastern shore of Keuka Lake, is open year-round for tasters. 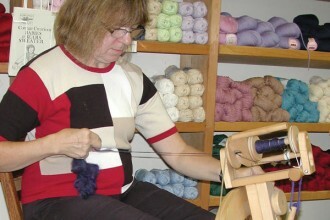 The McGregor Clan Club is a vibrant and large group that encourages new members. Details can be found at mcgregorwinery.com. While at the winery, I was offered a sample of the 2007, 2010, 2011 and 2012 vintage by owner John McGregor. One could taste progression of flavors from the 2010 to the 2011 vintage, likely from bottle age alone, from strong tannins to brighter fruit and softer undertones. The un-released 2012 was only starting to show its stride but also showed promise. The 2007, however, tasted like an entirely different wine – earthy, herbal, complex, with dried fruit and cocoa. Eight years made a very big difference. These are cellar wines.